This regatta is the highlight and the seasonal closure of the Mediterranean classic yacht regatta season. At the end of September the most classy and most significant classic yachts from all over the world meet once again at the small but renowned Mediterranean village of Saint Tropez at the Côte d'Azur. 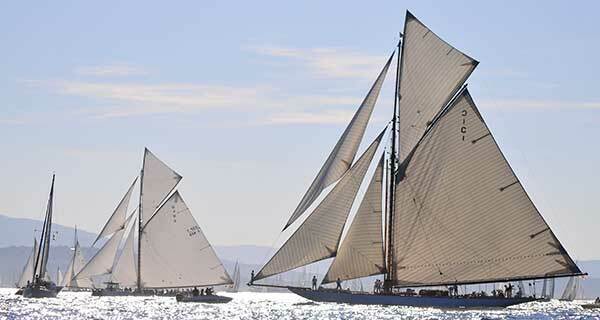 While the modern super yachts race during the first two regatta days, the classic yachts are the real emphasis of Les Voiles de St. Tropez and compete in the race during the remaining days of the regatta. They offer a beautifully fascinating and exciting experience for the spectators. No need to observe the show from a distance though- we offer the thrilling and lasting experience of participating in the race on one of our impressive classic yachts! Join as a skilled yachtsperson or as a newbie to the sailing and racing world in the fun of the regatta. Together with the experienced regatta crew onboard you can feel the excitement of the start of the race, the piloting around the regatta buoy and the adrenalin of reaching the finishing line! And of course you have the chance to anchor this amazing experience by playing „reporter“ on the waves, taking pictures of the race as well as the beautiful synchronicity of classic yachts, ocean and scenery! Do you want to experience the excitement of a regatta but rather as an observer than an active participant? In addition to active racing attendance we also offer the possibility to join the regatta on an spectator boat. This way you are still in striking distance of the racing and maneuvering classic yachts yet you can watch and relax and maybe use the unique opportunity to take breathtaking pictures or videos of one of the world's most significant classic yacht races!